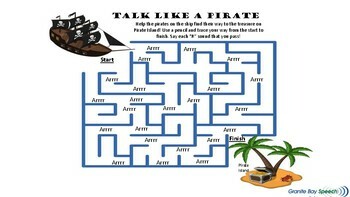 National "Talk Like a Pirate Day" is such a fun day for speech therapy! We would love for you to incorporate this fun activity into your therapy sessions as you work on the "R" sound. 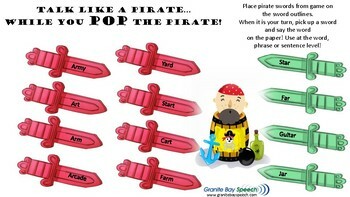 The second page is made to be played with "Pop the Pirate". Place the game swords on the paper and then when it is the child's turn, have them pick a sword and say the word. This can be used at the word, phrase or sentence level! Please leave us feedback if you enjoy our activities. Thank you!